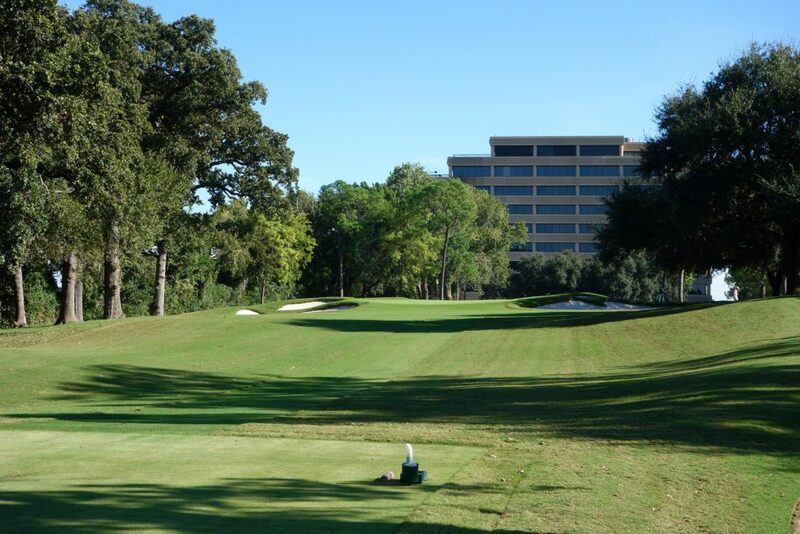 My chance to play Brook Hollow Golf Club in Dallas, Texas came out of the blue. The trip to Dallas was to participate as a groomsman in a good friend’s wedding, and a few weeks out, the groom emailed asking if I wanted to grab a round at a place called Brook Hollow prior to the wedding rehearsal. 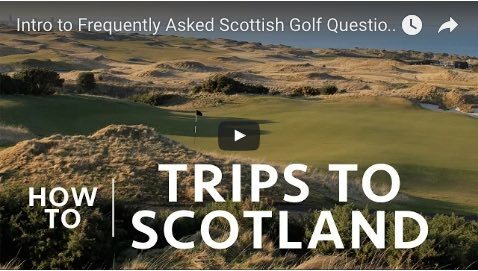 I happily said yes, having no idea what Brook Hollow was or who had designed the course. 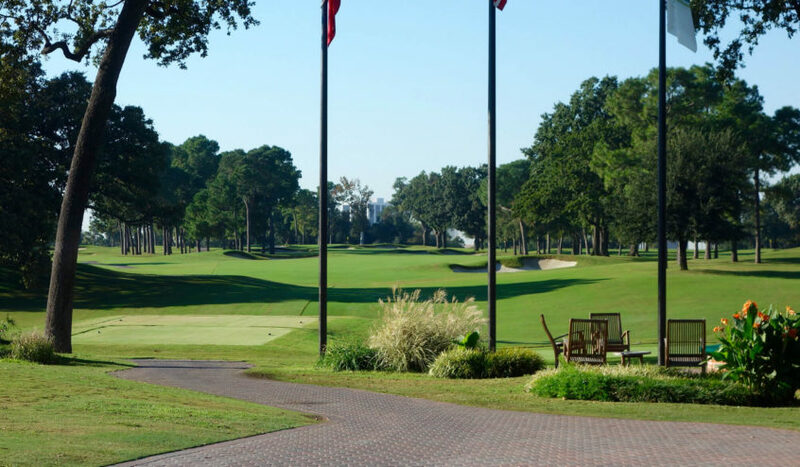 After a quick Google search, an article titled “Dallas’ Most Exclusive Private Clubs” called Brook Hollow, “Dallas’ most prestigious club” and explained that their A.W. 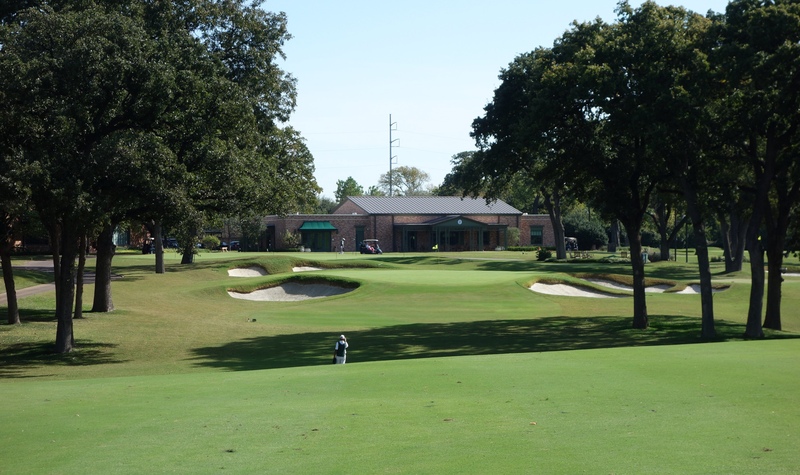 Tillinghast-designed course is one of the “secret jewels” of Dallas. To say the least, my interest was piqued! After reading everything I could online, I looked back at the invitation and realized the wedding reception was at Brook Hollow. Over the course of the weekend I ended up spending a lot of time at the club, and I liked it more and more as time went on. Understated describes Brook Hollow well. Nothing is flashy, but everything is extremely high quality. The men’s locker room and grill were some of my favorite places. Football was on the TV, men were playing cards and grabbing food, and huge windows looked onto the course from the grill. The locker room had classic wooden lockers, but also had a sauna, jacuzzi, and showers that received a very respectable 6.5 on the PowerShower Rating Scale. An accomplished amateur player named Cameron Buxton commissioned his friend A.W. 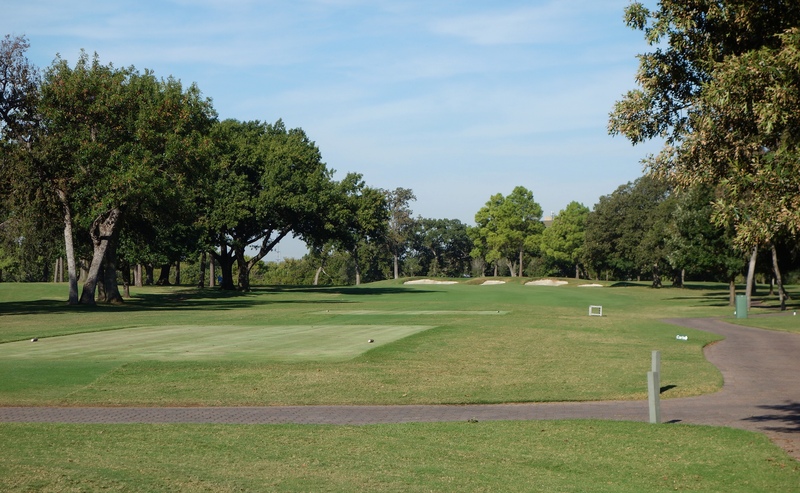 Tillinghast to build Brook Hollow Golf Club, which opened in 1920. The story goes that they searched the farmland outside of Dallas until they found a rare sandy area that was perfect for their project. 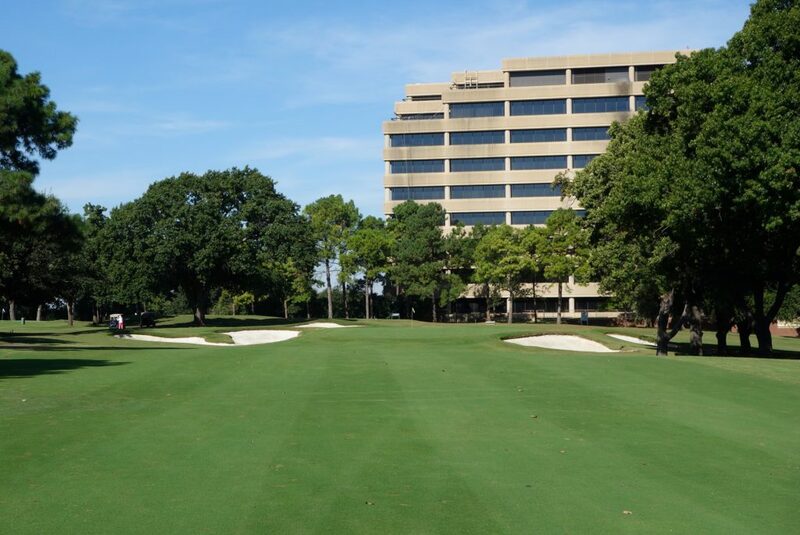 The course was lightly tweaked by Coore & Crenshaw in 1993, and recent renovation work deepened many of the bunkers on the course. That recent bunker work was done by Tripp Davis, and thank you to the readers who filled me in on that info in emails and the comments below. Today, Dallas has grown out to Brook Hollow. 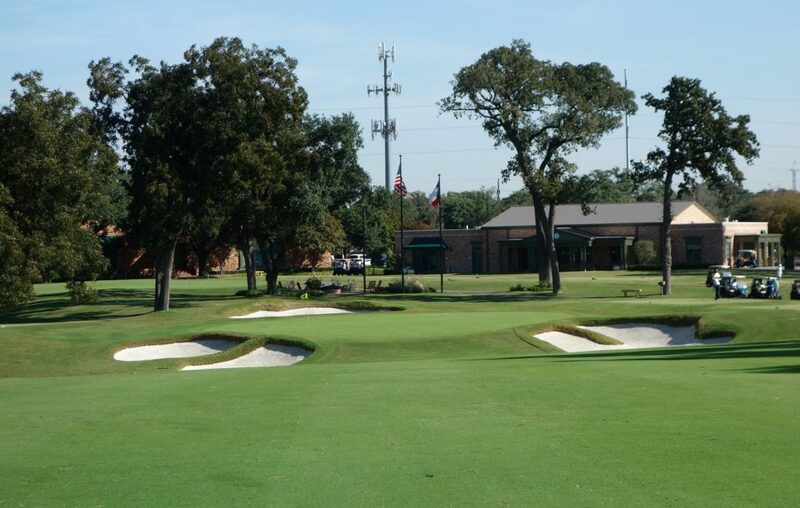 A brick wall surrounds the course and you could miss the gated entrance to the club if you weren’t paying attention. Inside those walls, it’s as peaceful and quiet as can be. 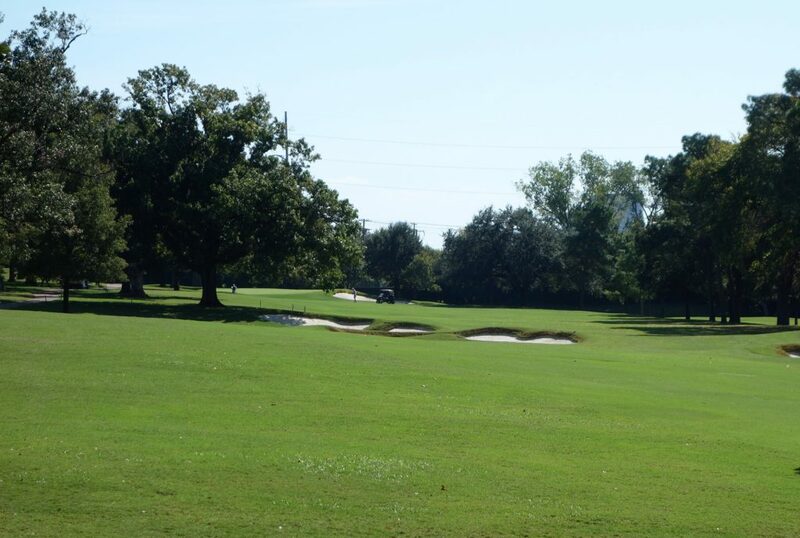 Hole #1 – The first hole is one of the few straight holes on the course. 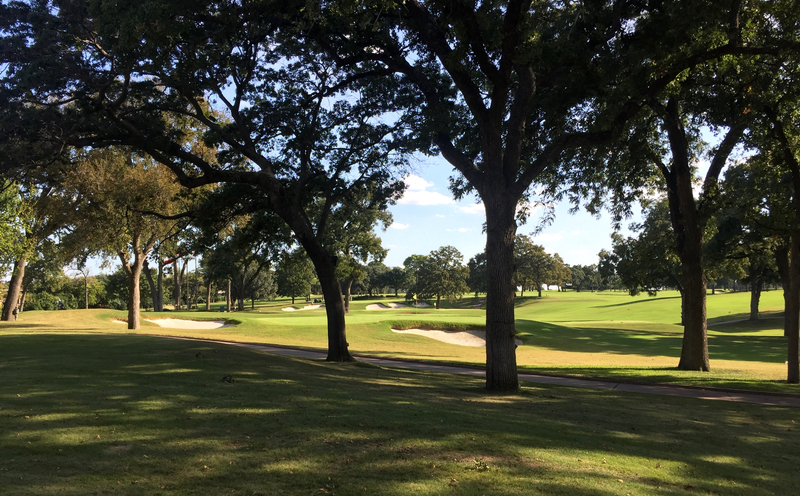 Trees narrow the par 5 close to the green and layered bunkers confuse depth perception for newcomers who don’t know the course. 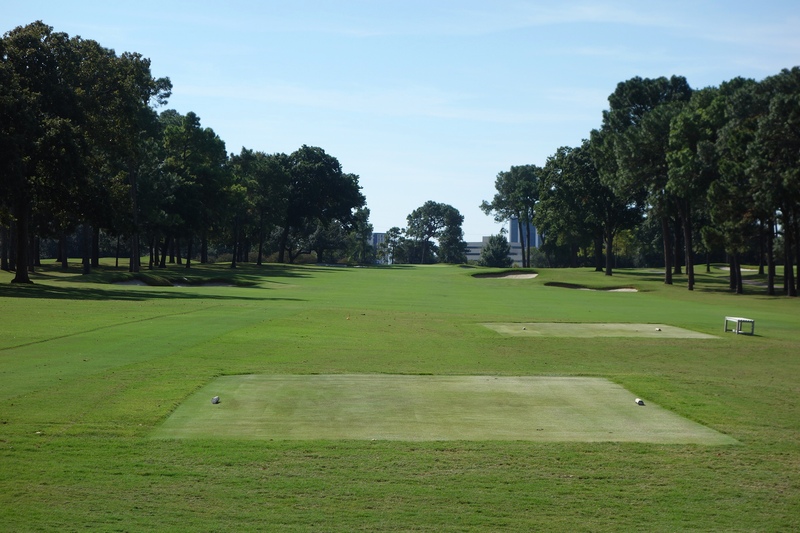 Hole #2 – This hole works gently to the right after a straight-away tee shot. The putting surface is slightly raised and deeper than it appears from the fairway. 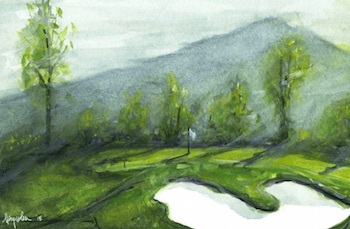 Hole #3 – The third at Brook Hollow is dogleg left with deep bunkers guarding the green. A hybrid or 3-wood at the fairway bunkers is the best play off this tee. 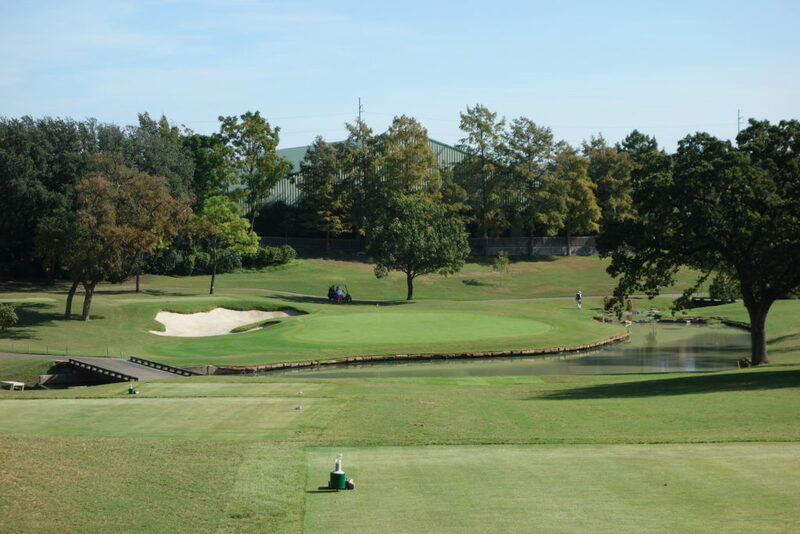 Hole #4 – I loved the par 3s on the course. 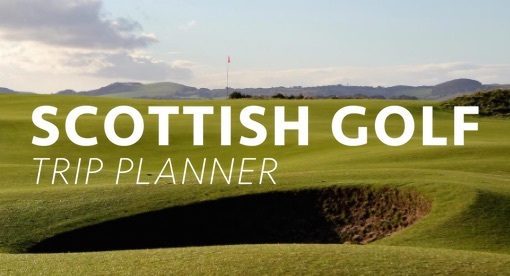 They all have large greens that present an opportunity to score, but surrounding bunkers punish missed shots. The 4th played 145 yards during our round. 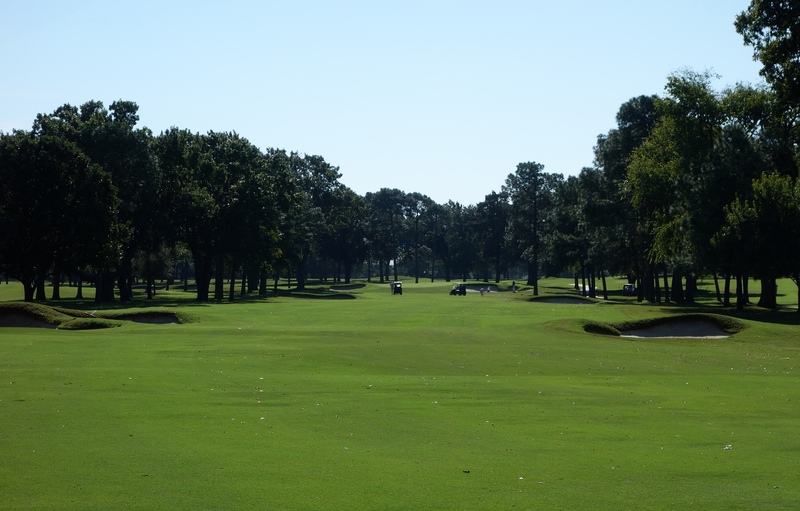 Hole #5 – This is another par 5 that narrows toward the green. 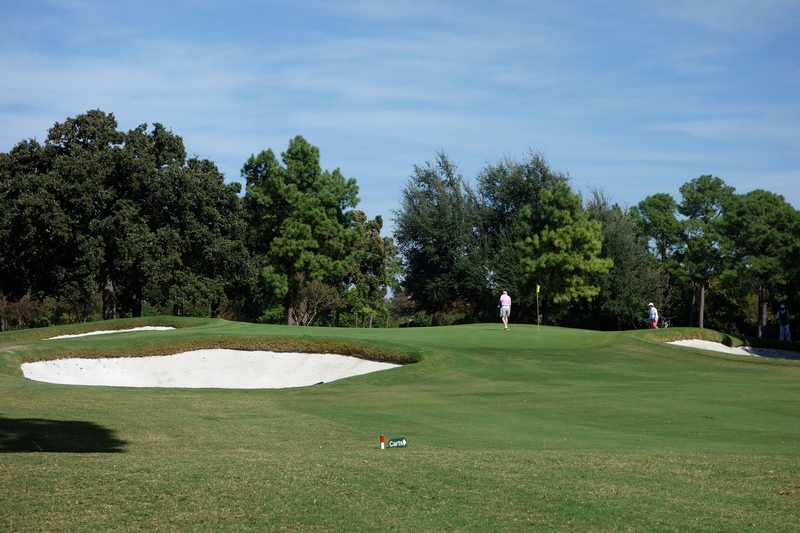 The green itself is wide, but shallow, and runoff areas and bunkers collect missed approach shots. 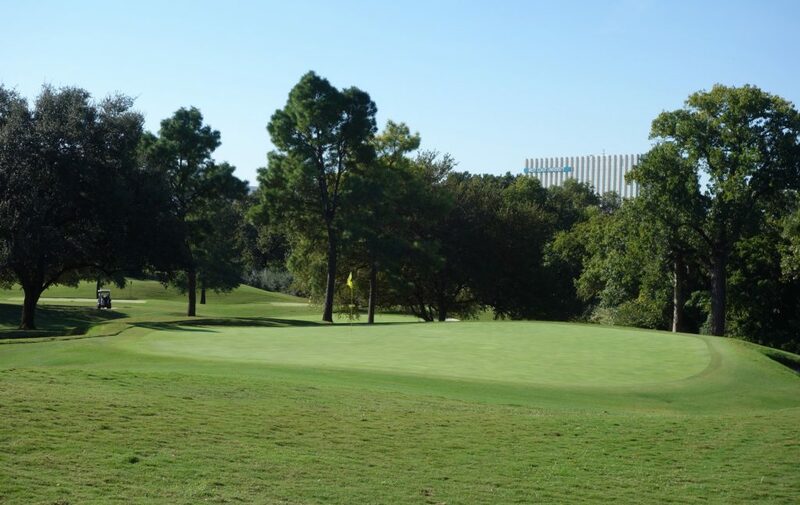 Hole #6 – The drive on the 6th hole gets you to the top of a small hill, where you turn slightly right and have this great view of the green. Despite the false front, you want to be below this hole. 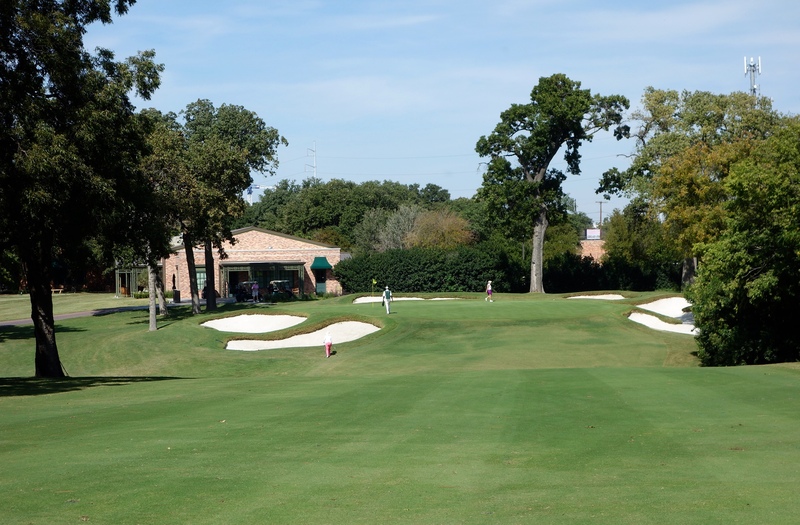 Hole #7 – The 7th is a severe dogleg right, and big hitters can carry the bunkers on the corner. 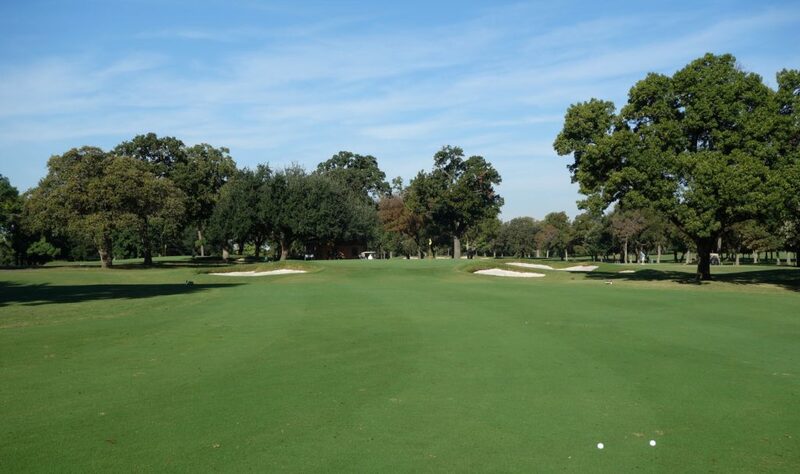 Even after a big drive over the corner, a mid-iron is still required to reach the green. Hole #8 – This picturesque par 3 was another example of a relatively straightforward shot, but plenty of hazards to play with your mind. 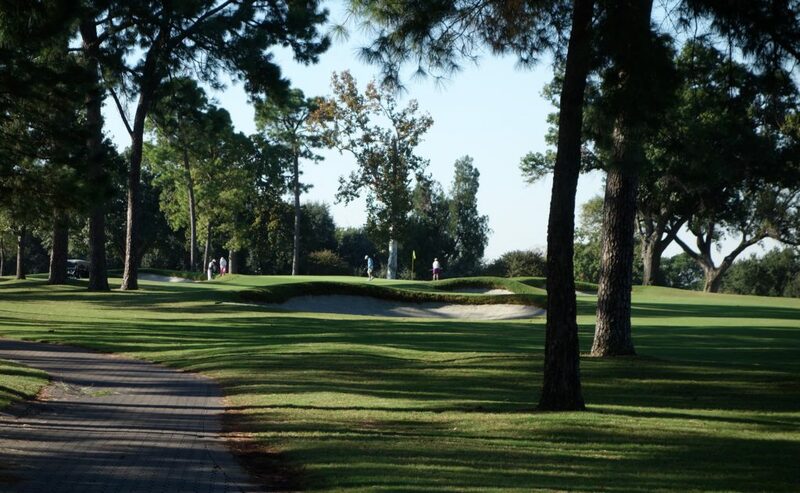 Hole #9 – A big dogleg left finishes off the front nine. A fairway wood carries the edge of the left bunker and leaves a short iron into the picturesque green. The brick clubhouse and pro shop can be seen beyond and to the left of this hole. 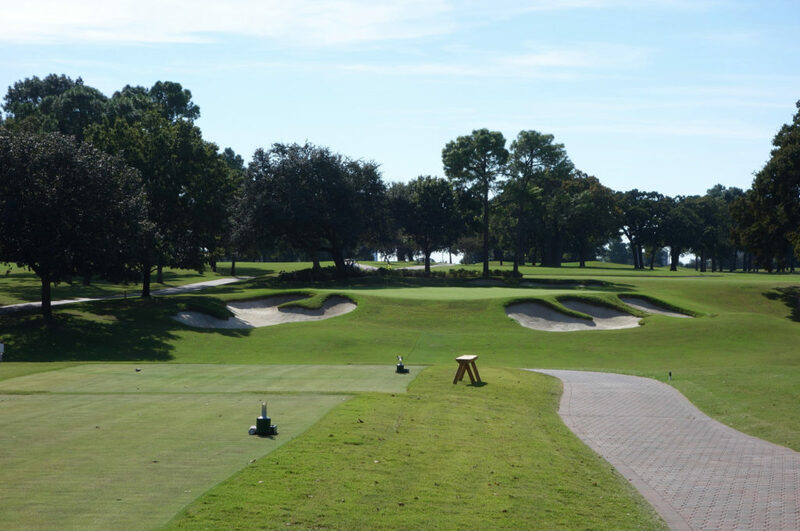 Hole #10 – The 10th is a par 3 right in front of the pro shop and bay windows in the men’s grill. Suffice it to say this shot is a little nerve-wracking with the gallery watching. But again, this short hole has a huge green and big hazards waiting to snap up a missed shot. 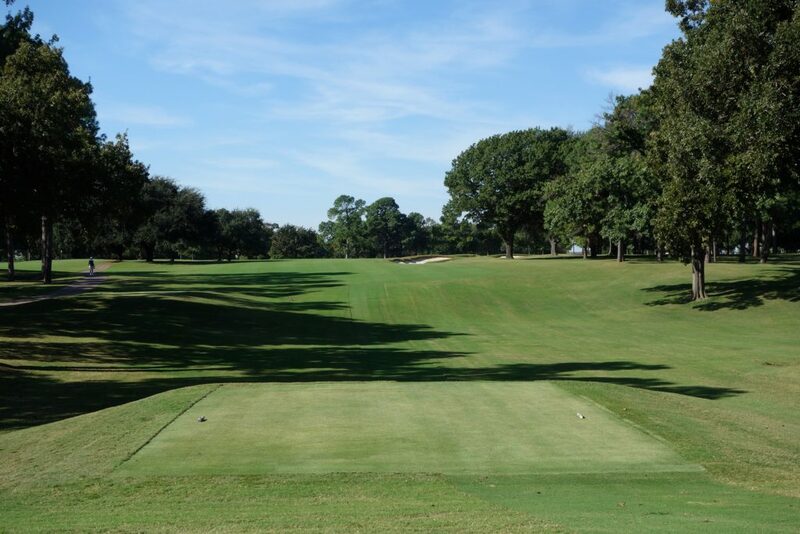 Hole #11 – This par 4 is another one of the few straight holes on the course. 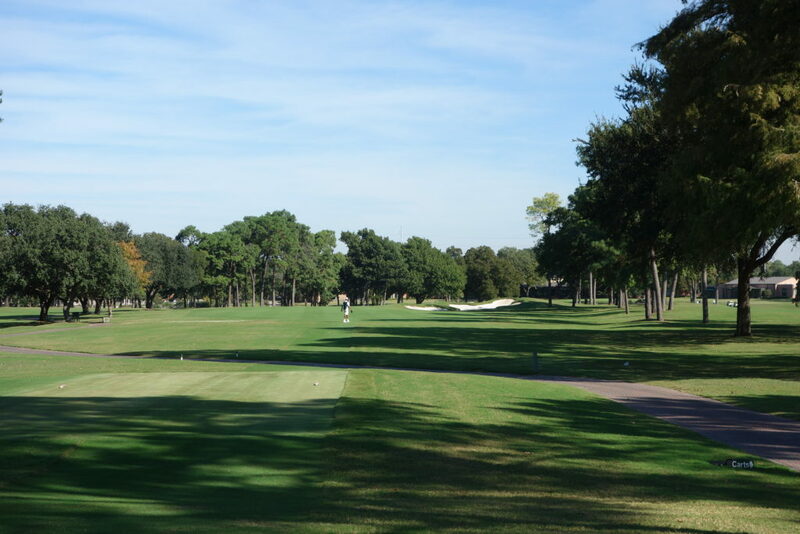 Hole #12 – Tee shots up the right side kick into the center of the fairway and leave an approach to a green that slopes heavily back to front. Hole #14 – This hole felt much more open than others on the course. A 3-wood leaves a mid-iron into the green, which is sitting on the hillside. 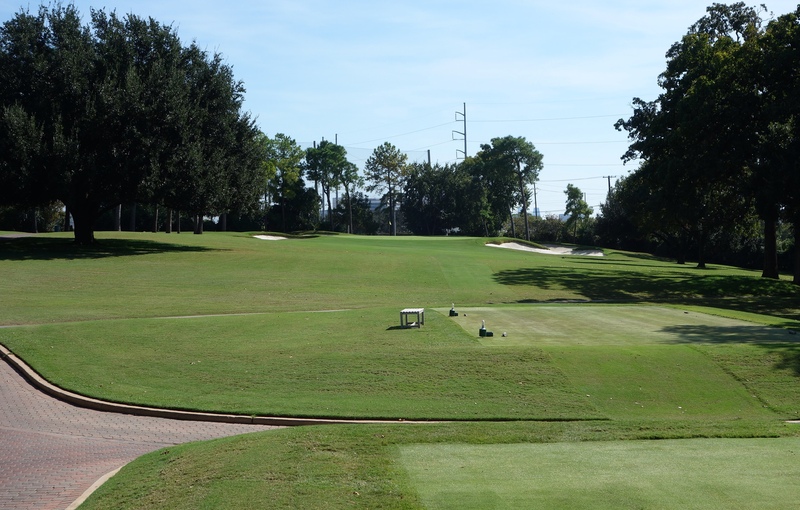 Hole #15 – The picture below isn’t taken from the tee box. The tee is further back and to the right, creating an uphill tee shot toward the set of cross-bunkers that are reachable for long hitters. 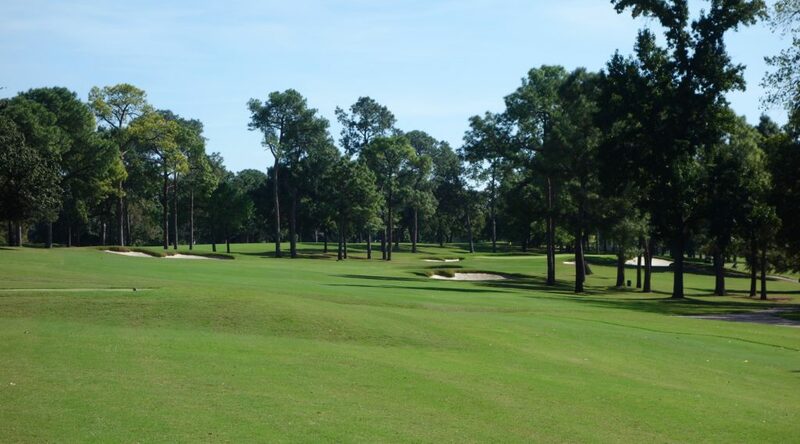 The tree on the left edge of those bunkers can also block aggressive second shots going for the green on this par 5. 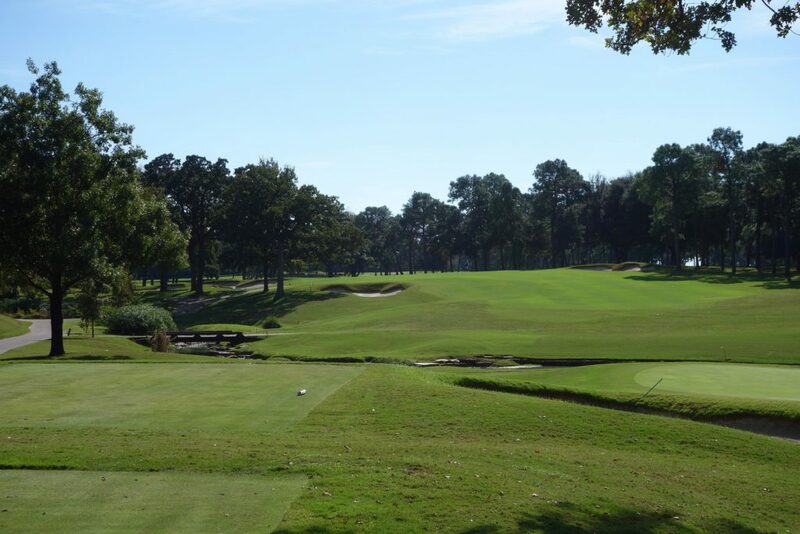 Hole #16 – This hole played 190 yards during our round, and it presents a final long-iron challenge. You leave this par 3 very happy with your par. Hole #17 – This hole works to the right and I loved the approach shot. 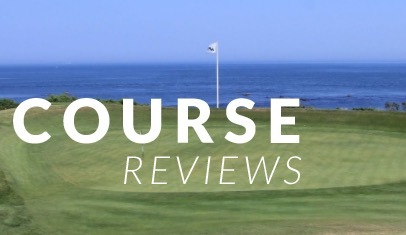 The green is slightly raised and is surrounded by deep bunkers with high lips. The shot below was taken from the left rough. 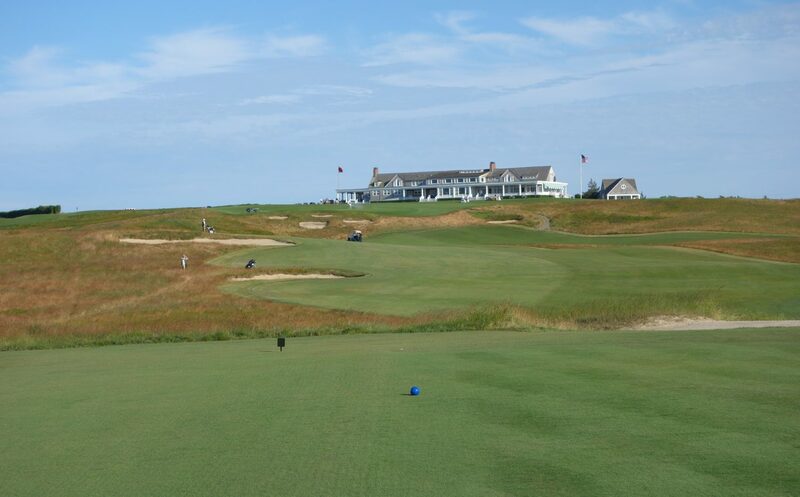 Hole #18 – The final hole’s tee shot plays straight away until the fairway slopes downhill and slightly left to the green. Distance control is key on the approach shot due to a sloping green that I suspect is a beast when rolling really fast. While some courses that feature tons of doglegs can be repetitive or boring, that isn’t the case at Brook Hollow. 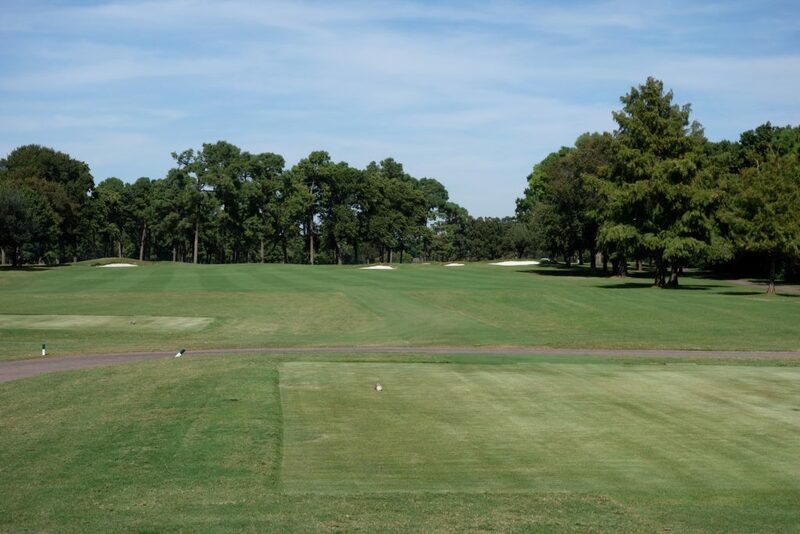 Holes move both directions and require a wide variety of approach and tee shots. There are areas where trees do slightly restrict play, but they add really nice character across the entire property. 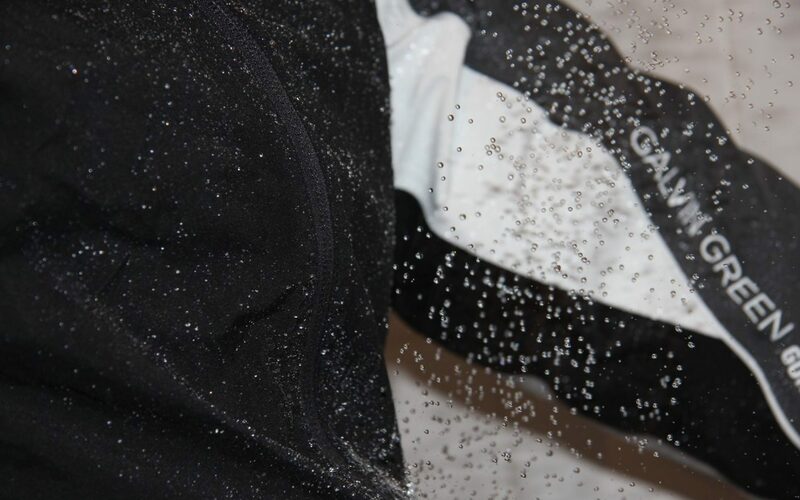 The longer you spend at the club, the more you notice in terms of detail. The cart paths aren’t paved, for instance. Instead, they are hand-laid brick that turns what is usually a pavement eyesore into a beautiful element of the club. 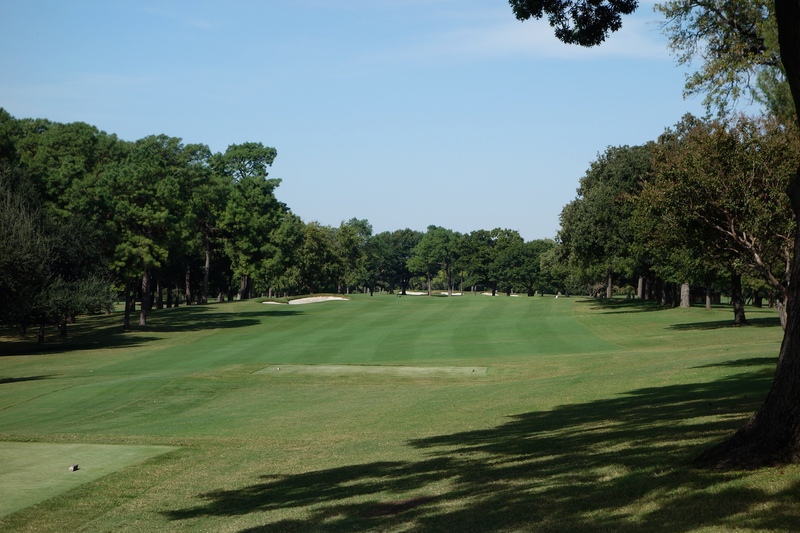 Brook Hollow’s history, membership, and traditions also add greatly to the experience. I count myself as lucky for having played Brook Hollow, and it reinforces something that I continue to find in my travels. 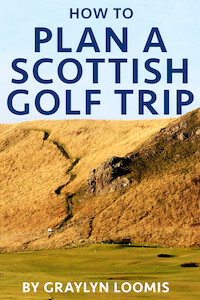 If you only concern yourself with the courses listed in the magazines, you miss some of the best experiences in golf. Thank you for the great review! I have played Brook Hollow as my uncle is a member there. 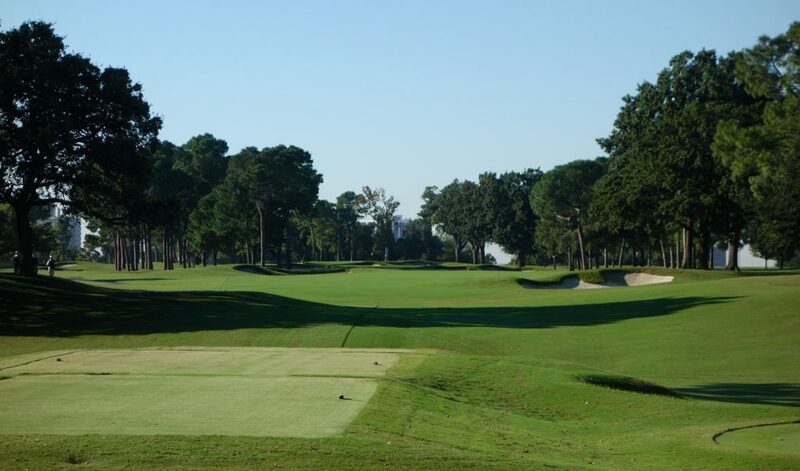 Great golf course, great club, great membership! What is your website with all reviews? Thank you for filling me in! I will update the review to include a reference to Tripp Davis. 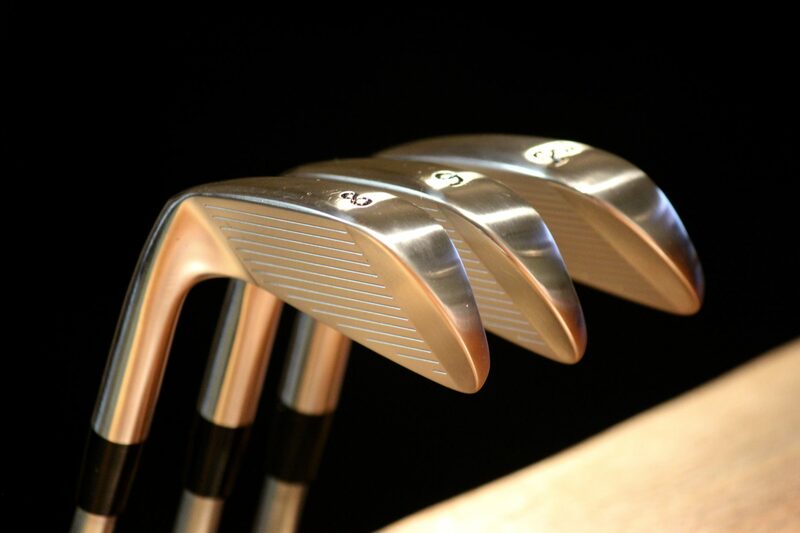 You guys have a great club there and I will certainly shoot you an email next time I am in Dallas with my clubs. I appreciate the generous offer to host at Trinity Forest! Tripp Davis did the most recent renovation work. Great review! Thank you for the comment! I am going to update that mention for Tripp Davis right now. Graylyn, Cameron B. Buxton was the 1916 and 1917 Golf Association of Philadelphia Amateur Champion and was a member of Huntingdon Valley CC. In fact, our first Amateur Championship trophy, was donated by Buxton and named the Cameron B. Buxton Trophy. My pleasure Graylyn. This came as news to us at the Association as we weren’t aware of his involvement down in Dallas. I’ll email you a picture of the trophy as it really is quite stunning. We actually don’t use it anymore except for display purposes as our Amateur Championship trophy now is named after our most storied champion, J. Wood Platt.